— Ben Chappell, prof. of American Studies, University of Kansas (via Eric Michael Johnson [@ericmjohnson on Twitter], who credits @rmmilner and @docfreeride as his sources), 15 Nov. 2011. The term “fascist” is used too often and too loosely in American political discourse. Mayor Bloomberg is not a fascist. However, in ordering the destruction of a library, the mayor’s actions evoke the symbolism of fascist and other totalitarian regimes. One expects that he did not intend a metaphoric alliance with such groups. 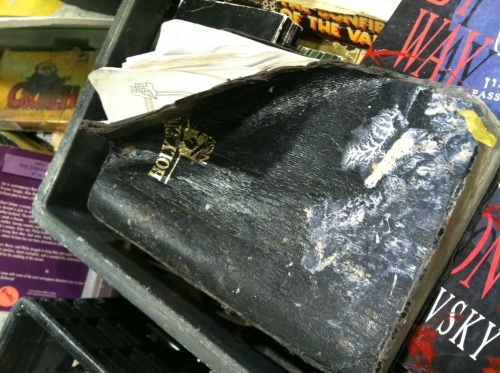 Indeed, he wisely ordered the books to be thrown in the dumpster, rather than having them set on fire. The accidentally fascist overtones of the mayor’s purposefully thuggish order may be the greatest gift he could give the Occupy Wall Street movement. Not only is the violence of this nighttime attack likely to galvanize the Occupy Wall Streeters, but it may also persuade others to join them. When you wage war on a library, you wage war on all who read, write, and think. When you attack books, you attack democracy. And when you do these things, people fight back. As Ben Chappell observes, “If corporations are people, tents are definitely speech.” And libraries are both. 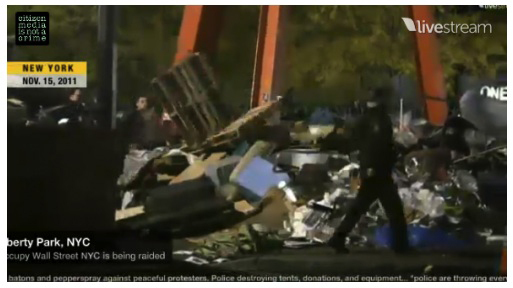 Image sources: “Urgent: Raid of Occupy Wall Street” (Occupy Wall Street Library, 15 Nov. 2011); “Occupy Wall Street Library Removed as NYPD Evicts Protesters” (School Library Journal, 15-16 Nov. 2011). 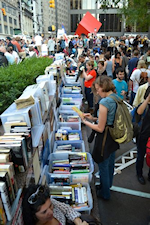 — Mayor Michael Bloomberg, 15 November 2011, after the NYPD and the NY Sanitation Department evicted Occupy Wall Street, destroying 5000 books. UPDATE as of 5:30 pm Central Time. All of the Library has not been destroyed. It’s being “held captive” by the City. Here is a photo, courtesy of Mayor Bloomberg’s Twitter account (and The Observer). 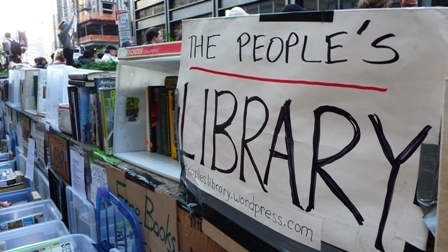 UPDATE as of 12:30 pm Central Time, 16 Nov. 2011: Occupy Wall Street Library reports “that their claim that the library was ‘safely stored’ was a lie.” About half of the books are missing; many others are damaged or destroyed. 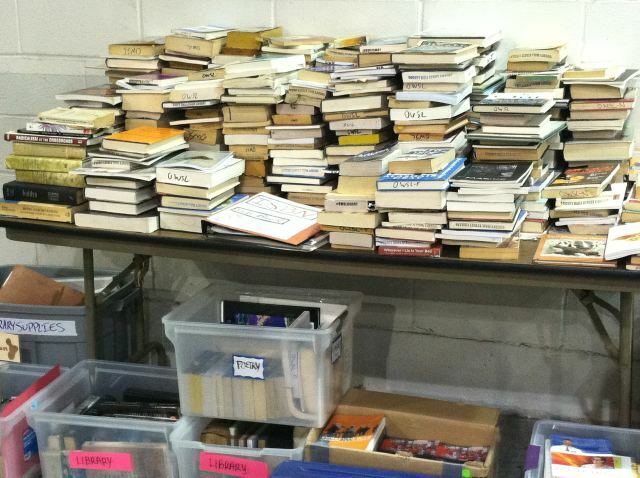 Initial reports that books were thrown into dumpsters seem, in fact, to be accurate. And this blog’s initial claim that the NYPD destroyed the library is also accurate. Image sources: “Michael Bloomberg Destroys a Library to Shut Down Dissent in New York City” (Irregular Times, 15 Nov. 2011); “URGENT: Raid in Progress” (Occupy Wall Street Library, 15 Nov. 2011); “OWS Library Safe and Sound; Held Captive By City” (New York Observer, 15 Nov. 2011); “UPDATE: State of Seized Library” (Occupy Wall Street Library, 16 Nov. 2011).